Anybody, anywhere who has a government job works for us. They work for the people, and it should be at our behest. The tax dollars that pay their rent and mortgage come from us, and I believe they are beholden to us just as an employee is beholden to their employer. That goes for teachers, firefighters, law enforcement, administrative personnel, and especially elected officials. If I’m elected to represent you, I will be working for you. I won’t be working for special-interest groups or lobbyists, just you. Everything I do as your representative will be to benefit the people of my district. That also includes all of the people who don’t vote for me on Election Day. To put it simply, I think a lot of people – in the public, and especially in the government – have forgotten who the authority is in our country. You – we – are the authority. We should have every right to criticize our government at every level, and there should be mechanisms in place to hold our government accountable for what it does (and doesn’t do) at every level as well. 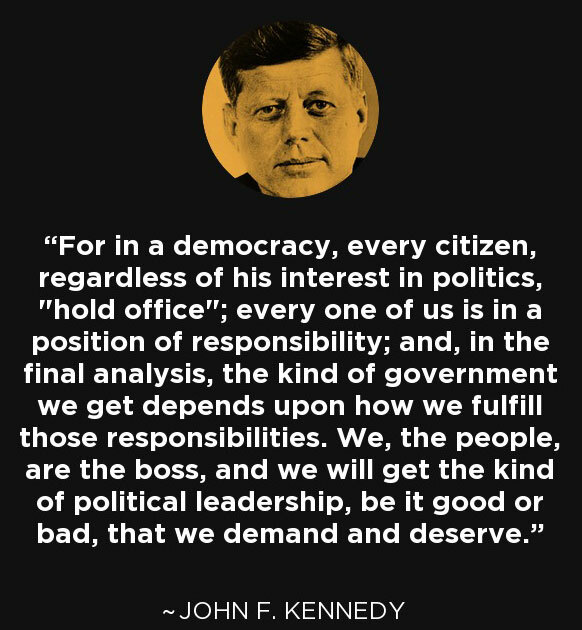 It has to be done this way if our government is ever truly going to be “by the people, of the people, and for the people” again.